Over 30 years ago, Dr Abdul Aziz Zakaria's father gave him a plot of land in their home state of Kelantan. Aziz's father had been a passionate durian collector. Before that, I used to bring seedlings back for my father to plant as I was exposed to a lot of durian clones when I was working in UPM," recalls Aziz, 73. Later, his mother gave him a two-acre plot, and he himself purchased a three-acre piece of land. Today, his three farms are host to 70 to 80 different kinds of durian trees and about 50 lesser-known traditional local fruit trees like buah tampui, buah kerian, buah bacang and buah tarap. But durian remains his main passion. In the earlier stages of his collecting (before the smartphone era), Aziz would even bring individual durians to a photo studio so he could photograph and catalogue each variety properly. Today, Aziz has amassed quite a large repository of rare durian varieties, like the durian botak, which as its name implies, is a thorn-free variety of the king of fruits. Then there is his prized durian kura-kura - where the fruit grows on the trunk of the tree. Aziz started collecting and planting durians over 30 years ago, and now has over 70 varieties of durians, including rare ones like the durian kura-kura pictured here. "This durian tree will only grow in the shade. It takes about 20 years to bear fruit, so if you're 60 or 70 years old, don't bother planting it now, lah," says Aziz. Aziz has also collected the rare red-coloured durio dulcis, which has a red exterior. But his favourite durian variety is the durio graveolens, whose flesh is a vibrant red or orange. He has at least 30 different kinds in his collection. "My favourite is the red-fleshed one but about 80 per cent of these durians will be orange, which is a stabilising colour," he says. To look for durian varieties, Aziz travels all over Malaysia, Brunei and other countries (although not as regularly these days as he doesn't have much space on his farm anymore). Many years ago, he even managed to get a local kampung durian collector to share 30 of the 50 kampung durians he had collected. "Only 10 managed to grow; the rest succumbed to disease or storms," he says. Aziz's next pursuit will take him to Kuala Lipis, Pahang, to collect a different species of durian kura-kura he has found out about. He says that collecting and growing durians is not for the faint-hearted, especially if, like him, you're not in it for commercial gain. He estimates he has lost at least half of his collection through disease, droughts or storm damage. One particularly bad storm wiped out 30 trees in one fell swoop! "It's not easy to make the trees healthy, because each species has different requirements. I let the trees compete - and the strong ones will survive. If a tree dies and a space becomes vacant, I'd plant a new tree," says Aziz. Nowadays, Aziz has become something of a durian expert. 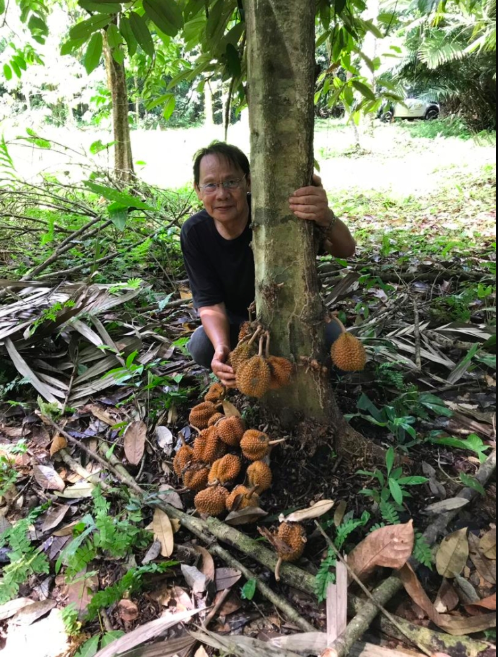 He gives seminars on growing durians, and is working on a book that he hopes will serve as a durian orchard management manual, documenting how to grow trees from beginning to end. The red-fleshed durian is Aziz’s favourite and he has so far collected 30 of this variety of durian (left). The duriodulcis, or red durian, is just one of the rare durian varieties in Aziz’s collection (right). His knowledge is so valued that he has even had farmers fly him to Indonesia just to determine if the Musang King on their farms are the real deal. "If you put the seed in front of me or if I get to look at the leaves and plant, I already know what species or clone it is," he says modestly. Because he deals so much in durians, you might think Aziz would have grown sick of eating the fruit. But as it turns out, he remains a passionate consumer of durians and still eats it every single day! "I keep the durian flesh in the freezer and have a piece of durian every day with budu and ulam, which is how we eat it in Kelantan," he says. Aziz also doesn't let the durians on his farm go to waste. As they are not intended for sale, he hosts a huge annual tasting where he invites between 50 and 300 of his friends to come and sample the fruit. Although he is getting on in age now and admits he has contemplated selling off his farms, Aziz says he doesn't really have the heart to do so because he is still so passionate about durians. "Although family members have been telling me to sell off the farms, I think I will keep collecting and planting for as long as I am healthy and able because the passion for durians keeps me going," he says.